You could say we’ve been looking forward to Simogo’s Beat Sneak Bandit [$2.99] The developer announced it just a few months back in November, but it feels like we’ve been waiting forever. After all, these are the folks that made Kosmo Spin [$0.99] and Bumpy Road [$2.99] two fantastic (if divisive) games, so who could blame us for a little eagerness? Now that the wait is over, you’ve gotta ask: does it live up to the hype? And I have to tell you that yes, it totally does. I don’t know of any other stealth rhythm puzzle games, but I’m pretty sure Beat Sneak Bandit could take on all comers. Every aspect has been expertly crafted, from the high level game design down to the details of the menus. Oh, and you guys? It’s so very, very fun. You should check out the trailer if you’re mystified about the idea of a stealth rhythm puzzler, but here’s the scoop in broad terms. 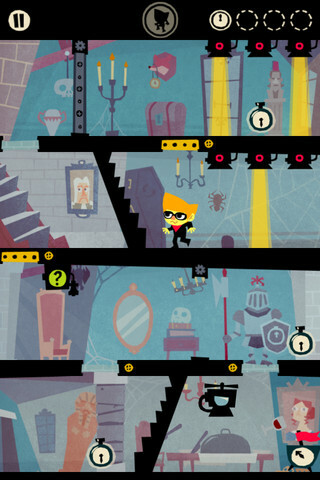 You play the Beat Sneak Bandit, breaking into the mansion of Duke Clockface. He has, for undoubtedly nefarious reasons, stolen all the clocks from Pulsebury. He’s kind of a jerk like that, I guess. Your job is to take back all the clocks without being caught. Your buddy Herbie the frog is there to help you on your way. Through a series of charming phone call scenes, Herbie introduces you to all the basics. First you learn that you can only move with the beat, as indicated on screen for those who can’t pick it out by hearing alone. 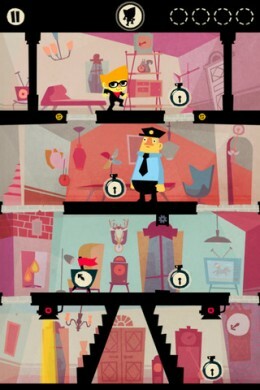 Tapping in time will sneak Bandit across platforms and onto clocks, completing each level as he goes. This isn’t a platformer, however. While Bandit needs to climb, fall, and turn himself about, these tricks are part of grander puzzles. As you progress through four areas that are dressed up with thematic backdrops, the Duke calls in to taunt you with his newest tricks and traps. You’ll encounter spotlights, which end your robbery attempt if they light up while you’re beneath them. Then there are guards on patrol, who will stop you if they see you. Robots come at you when you sneak across their floor, and they need only move above you to end your spree. The environment is none too simple either, as it’s littered with gates, trap doors and teleport pads. So moving to the beat is only a small part of the challenge. Most of your attention will be paid to planning out a safe route through. Generally it isn’t all that hard to reach the main clock, but there are four smaller clocks scattered in each level, and reaching those always requires some creative thinking and careful timing—moving off beat destroys the one on your floor. Since you move to the beat and so does everything else, planning ahead for where you’ll be and which direction you’ll be facing when you get there is doable, but always more and more challenging. Beat Sneak Bandit is very forgiving, so no matter your skill you’ll always be able to move forward. When you fail a level a few times, Herbie will check to see if you want to skip it, no harm done. You don’t strictly need to complete any given level to progress, never mind collecting the extra clocks. 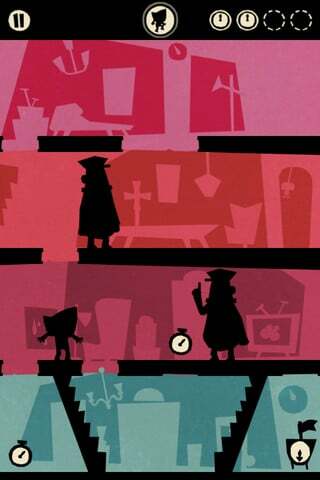 If you do manage to collect most of the clocks, though, you’ll open up bonus shadow levels that cloak you in silhouette. These are harder than the others by design, and the shadowed world doesn’t make things easier. They are gorgeous, though. In fact, everything in this game is gorgeous. The few cutscenes are beautifully laid out, the levels are designed with a good measure of whimsy, and the animations are adorably irreverent. Even the interface elements hold to the look of the game perfectly, right down to the last detail. And then, of course, there’s the music. It’s hard to put a finger on the thread that holds Beat Sneak Bandit’s music together. It always has a good beat, and a similar theme runs through each level. But the sound varies between electronic, jazz, funk and more spooky tracks. These are constantly changing from level to level because part of each track is made up of the sounds of all the moving pieces. Patrolling guards make one sound as they move, trapdoors opening and closing make another. Not only is this aurally excellent, it also means you can use your ears to keep track of each moving part. I have no complaints—my time with Beat Sneak Bandit has been thoroughly enjoyable from start to finish. But I do have two small nitpicks. First, a few too many levels rely on waiting (and waiting) while moving elements cycle all the way through their patterns repeatedly. As great as it feels to figure out the right solution for claiming all the clocks, having to wait to make it happen can be a pain. Second, the finale flies a bit off the difficulty curve. The battle goes on too long, and you may find yourself frustrated while repeating the early parts again and again—or at least, I did. That’s very little frustration to a whole lot of excellent gaming, though. Beat Sneak Bandit sports 40 main levels and 16 shadow levels. It also has 20 Game Center achievements, most of which encourage you to play in new and challenging ways rather than appealing to your completionist side. Of course, you can also earn one for collecting all the extra clocks, but that’s a challenge that’s quite a lot of fun to work toward. It’s rare to find a game that does something so original so well, with every element of gameplay and design falling into place. Simogo has pulled it off with Beat Sneak Bandit. In my books it’s a must buy, and such a shame it would be to miss out. Play, enjoy, and let us know what you think in our forums.